19-year-old IDF soldier wounded in Samaria attack Sunday no longer in mortal danger, says hospital, as his condition stabilizes. 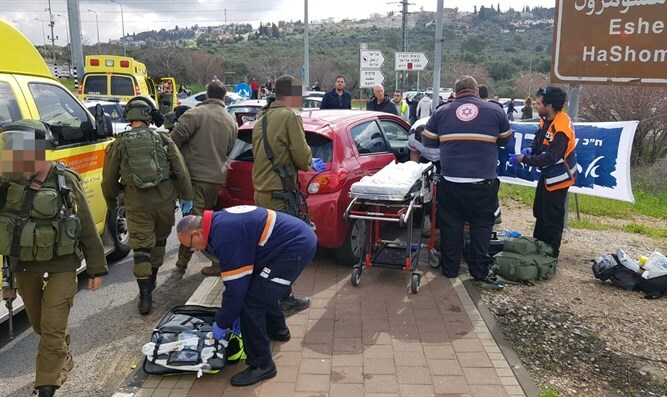 The third victim of a string of terrorist attacks in Samaria on Sunday is no longer in mortal danger, hospital officials said Tuesday morning, as his condition stabilizes. Alexander Dvorsky, 19, was one of three Israelis shot during a string of attacks by a Palestinian Arab terrorist in central and western Samaria Sunday morning. The terrorist, later identified as 20-year-old Omar Abu Lila, stabbed 19-year-old IDF soldier Gal Keidan at Ariel Junction, stole his firearm, then shot him to death, before stealing a car and proceeding west, where he shot and wounded Rabbi Ahiad Ettinger, 47, and Dvorsky. Both Ettinger and Dvorsky were seriously wounded, with Rabbi Ettinger succumbing to his wounds on Monday. On Tuesday, officials at Beilinson Medical Center in Petah Tikva announced that Dvorsky’s condition had stabilized, and that he was no longer in immediate mortal danger. Nevertheless, the 19-year-old IDF soldier remains in the hospital’s intensive care unit, and is listed in moderate-to-serious condition. Dvorsky is fully conscious, and is breathing on his own, the hospital noted. Dvorsky emigrated from Moldova to Israel, following in the footsteps of his brother, moving to the city of Upper Nazareth (Natzrat Illit) in the Galilee, before he was joined by his mother and grandmother. “There are no words to describe it,” said Dvorsky’s brother, Oleg, regarding his first meeting with Alexander after the attack, Channel 12 reported.